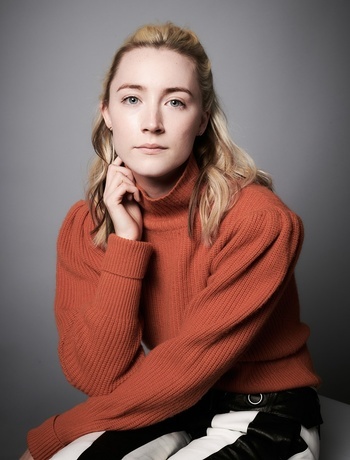 Saoirse Una Ronan (born April 12, 1994 in New York City) is an Irish-American film actress.note "Saoirse" is the Irish Gaelic word for "freedom". While the name is most commonly pronounced "seer-sha", Ronan herself pronounces it "sur-sha", to rhyme with "inertia"; this is one of several regional variations in how the name is pronounced, and for Irish people is an immediate indication of Ronan's upper-middle class Dublin background. She's best known for her roles in Atonement, The Lovely Bones, Hanna, Brooklyn and Lady Bird (she received Academy Award nominations for the first and the latter two). She's been known in recent years for her portrayal of mature characters, who rarely are Irish or American. Susie Salmon from The Lovely Bones is a pure and innocent soul whose life gets tragically cut short by a Serial Killer. Agatha from The Grand Budapest Hotel is as lovely and lovable as she is helpful. Innocent Blue Eyes: As Susie Salmon and Agatha, again.